Whether you’re ready or not, the holidays are here—and with that comes the task of holiday shopping. After all, ’tis the season to be jolly and to be shopping, right? From stocking stuffers and hostess gifts to the perfect romantic present, MedMen has crafted the ultimate holiday gift guide for any marijuana user in your life. Because whether they’re a longtime enthusiast or new to cannabis, giving the gift of weed is what everyone needs this holiday season. 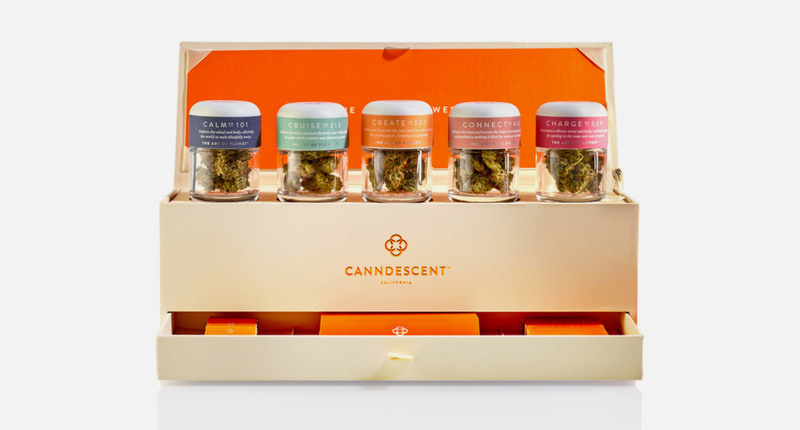 Canndescent creates marijuana products that are focused on the effects of weed, aptly naming their products after the desired experience you want: Calm, Cruise, Create, Connect and Charge. This season, they have a limited-edition kit that they released exclusively for the holidays. They created only 1,000 and MedMen is one of just three retailers who carry it. The holiday box offers a two or five jar option with packaging that is so chic, you don’t even need to wrap it. Nothing says “I love you” quite like a gift from Foria. The romantic choice for that special someone on your list, Foria products bring out the sensual side of cannabis with sensual enhancement oils for women and their partners. With a mix of coconut oil and cannabis oil, Foria Pleasure harnesses the relaxing power of cannabis and is the perfect gift for your partner. Sometimes you need something sweet to get you through the season, and Défoncé Chocolatier has got your back. With delicious, high-quality chocolate bars that come in a variety of flavors (mint is our winter favorite) and well-designed packaging that makes it stand out from the rest, Défoncé is the ideal holiday treat to gift. Lord Jones offers various edibles, all of which are festive favorites. Gift some Dark Chocolate Sea Salt Caramels to your in-laws and decorate your gingerbread houses with some Old Fashioned Gum Drops—it’s sure to be a season to remember. And with high-end, tailored packaging to give it that extra touch, giving the gift of Lord Jones is sure to wow. Next on the list is Beboe’s holiday gift box. Featuring one indica vaporizer, one sativa vaporizer, and sativa pastilles, this box of cannabis treats is the ideal gift for anyone looking to indulge in an elegant microdosing experience. And with a new rose gold design, the packaging is fit for holiday gifting. Rounding out the list of presents is dosist’s holiday wellness kit, which is sold exclusively through MedMen. Dosist gives a whole new name to vaporizers with targeted, dose controlled devices that were named one of TIME’s best inventions of 2016. Perfect for those new to cannabis who are looking for help with pain, insomnia, stress, or are just looking for a way to unwind and have fun. Their holiday kit isn’t just for others—you can even give yourself a seasonal gift to help survive the holidays when in-laws and family members come to town. Designed as fully functional medical kits, each contains four to six of their award-winning formulas as well as a sixty page field guide to cannabis while supplies last — exclusive to MedMen. Get into the holiday spirit and shop our favorite cannabis holiday gifts at a MedMen store near you.